Take your show on the road! Keep your book on-trend – and expand your revenue opportunities – by creating a custom Audiobook that’s road-ready for a growing audience of literary audiophiles. Scroll down to the Product Details to learn more about the custom Audiobook option from Outskirts Press. We will initially bill you a $499 non-refundable down payment to initiate the audiobook creation process. This amount will be applied toward your final per word narration cost and will cover the first 5,000 words of your manuscript. Your actual, final cost will depend upon the length of your manuscript over and above 5,000 words and will be billed at 5 cents per word. This final amount will be added to your shopping cart for secure payment before we begin recording work on your audiobook. Successful self-published authors know all too well that the easier it is for book enthusiasts to access your work, the greater your chances of selling. That means not only making your book available through a variety of booksellers but in a variety of formats. Audiobooks are rising in popularity as an increasingly mobile population takes reading on the road during long commutes. The custom Audiobook service from Outskirts Press provides you with everything you need to take advantage of this new avenue of selling. Want a sample? Click here to listen to the first 15 minutes of Self-Publishing Questions Asked & Answered, by Brent Sampson. * a professionally produced Audiobook that is distributed via Amazon, Audible, and iTunes. * a custom Audiobook cover image that is drafted from your print book's cover. * a 5-minute retail sample to use for promoting your Audiobook. 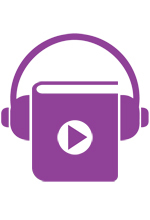 * a 15-minute sample to use for promoting your Audiobook. An Outskirts Press Marketing Consultant will be happy to work with you to answer your questions about the custom Audiobook option. For assistance call us at 888-672-6657 or communicate with one of our staff using the live chat option on our website. See how this book looks (and sounds) on Amazon by clicking here.